I love a good manicure as much as anyone, but unfortunately I don't always have time to stop during regular business hours to get my nails done... It's just not possible and that's the reality of my schedule so I like to have great products at home that I can use to make my nails presentable late at night or early in the morning if I need to. 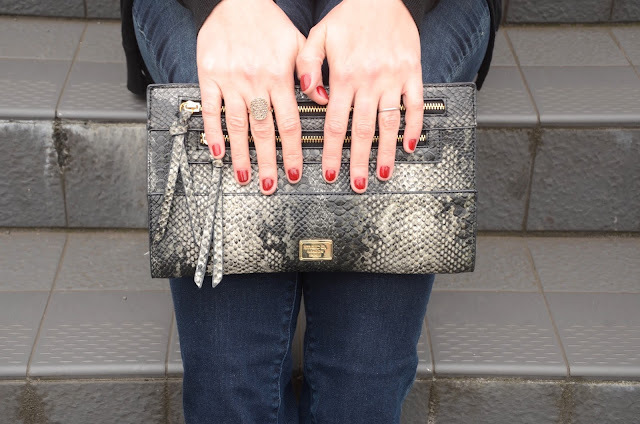 Whether it's for a photograph, for an event or just to keep my nails tidy and neat, it's important to me to keep them looking good between the times when I can stop and have a proper manicure. 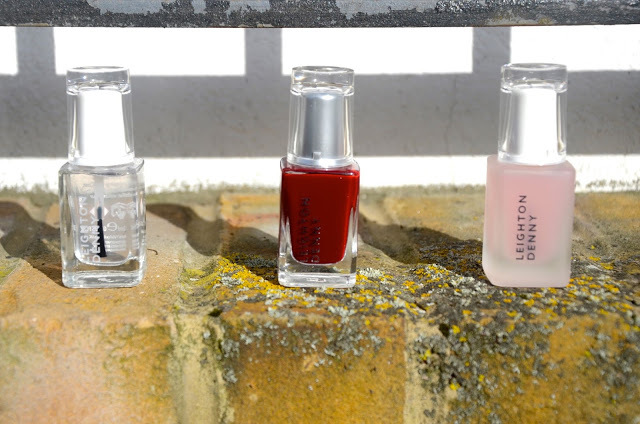 I've used Leighton Denny nail polishes in the past, but I recently discovered some of the other products in the range and they're fantastic. Occasionally my nails peel and even when they don't, they're fairly wimpy and they always have been, so anytime I can find a base coat that nourishes or strengthens I'm all about it. Leighton Denny Rock Solid Reinforcing Treatment does this job beautifully. It's a smooth base coat option that protects and encourages nail growth, bonding to the nail beds and rebuilding the fibres so that nails feel restored. I've only been using this product for about a week and my nails already feel stronger and the peeling has stopped. In the Gloss Plumping Top Coat is equally as impressive, offering a gel-like look without the hassle of a salon gel manicure. It's easy to remove, easy to apply, long-lasting and super glossy. Both of these products are great and can be purchased separately or together as the Rock Gloss Duo for £21. Leighton Denny High Performance Nail Colour in Passion is a deep red, but what I love about it most is how it catches the light and brightens up. As I'm typing this my nails look a sort of burgundy color, however when I'm outside or in a brighter light, it looks more like a classic red. I love this color and for me, it's a nice and easy transition into a brighter color from my usual go-to black nail polish. Paired with In the Gloss and Rock Solid, this is an easy DIY manicure that dries pretty quickly, has staying power and looks glossy and chic. In the Gloss, Rock Solid and Passion are £12 each and available online from the LD Boutique.